This blog is about my commitment to donate 25% of my Amazon revenues from The OLIGARCH, to a Guatemalan charity. But first, an editorial. The American racial experience from 1865 until 1965 (2015? ), is nothing to crow about. The underlying racism in the White nation permitted a continuing degradation (including a virtual enslavement) of the Black nation. It was most obvious in the South where I grew up and developed my own attitudes. But the underlying racism was everywhere. And still is, in spite of our better selves. In Guatemala, the left wing rebels came to realize by the early seventies that the insurrection could not be won by trade unions, intellectuals and students alone. The peasantry also had a lot of complaints against the government and were obvious allies in the cause. And over half the population was comprised of them. They—many, at least—responded. The problem for the peasants was that they were mostly Mayan. They lived a distinctive lifestyle in distinctive communities. They were Indians. And like Blacks in the U.S., were already despised at some level by a large part of the more “white” population. The end of the Cold War brought a dramatic reduction in support for the military government. The official Guatemalan response was a cynical (realistic?) “now you’re here, now you’re not” attitude towards the Yankees. Of course, the Afghans (Charlie Wilson’s War) and Iraqi Kurds had the same complaint. You love us while you need us but when that ends, where’s the love? And arguably, in Guatemala the oligarchy was winning the fight at the time and had little motivation to negotiate without the pressure from the U.S. But just prior to the end of the Cold War, the war in Guatemala had taken a truly nasty turn. It left a truly nasty legacy. Vigilante and death squad violence was already well known by the Indigenous. But in 1974, under the leadership of a General-turned-President Laugerude, the fight took on a serious focus on the Indigenous. These policies were continued by another general turned president, Lucas-Garcia in 1978 and brought to an incredibly violent head by a third, the evangelical Rios Montt. Thereafter, while the overt violence may have lessened in terms of volume, the nature of the violence remained horrific under yet another general/president, Mejia Victores. It is unrealistic to expect that the underlying racial attitudes of the Guatemalan middle and upper classes that tolerated these excesses, evaporated with a peace treaty. How to win the peace? 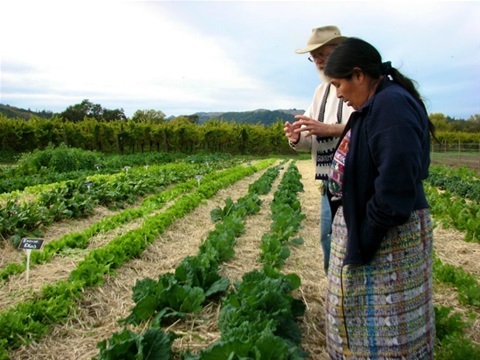 2002: Slow Food Sonoma County North nominated AMIDI (Association of Indigenous Women for Holistic Development), a group of 40 Guatemalan Mayan women, for the International Slow Food Award in Turin, Italy. AMIDI won first place for their operation of raising hens for eggs to sell at market. Since then, AMIDI and our convivium have developed an ongoing relationship of mutual education and support based on agricultural traditions, food preparation, cultural values around food, and Slow Food concepts. We have established a scholarship program for both children and adults; raised funds for safe, ventilated, fuel-efficient wood burning stoves for each AMIDI member; created a market for their traditional, handmade table weavings. Our convivium has brought their leader to Sonoma County for educational visits that inspired her to teach AMIDI women to create raised beds for vegetables and farm organically; keep bees; adapt agriculturally to climate change; protect the soils from erosion through reforestation; grow, dry, and sell traditional Mayan herbs that are medicinal; and learn to improve coffee cultivation techniques. Here is a link. Hope you’ll donate also.